I’m an unapologetic collector of children’s books. I’m not sure I’ve ever met a picture book I didn’t like! I have books for any reason and any season in my personal library — even fall books for children. I own literally dozens of books by one of my all-time favorite authors, Cynthia Rylant. “Perhaps there’s more to a scarecrow’s life than meets the eye,” she writes. Then she goes on to explore just what that “more” is, bringing meaning to our straw-filled field friends. Here are also 12 cozy bedtime books for your toddler and 5 books that will empower young girls. Who can’t resist the beautiful artwork and timeless stories by our beloved Mrs. Potter? In this story, Nutkin, his brother Twinkleberry, and all his cousins make their way over to Owl Island to gather nuts. Unfortunately, they run into a grumpy guardian owl, Old Brown. This book is written by the author of the books Goodnight Moon and Runaway Bunny, for children ages 3-7. David Diaz’s award-winning illustrations are incredible! I include these two books together because they have to do with food. Our family used to gather with another family each season to make applesauce. Also, our small town boasted a conservative Mennonite family who owned an old cider press, where we would purchase cider. You can always visit farmers’ markets or local orchards to experience the same. Both books celebrate the delicious delights of the season. This fun book pays homage to the song I sang as a child, “I Know an Old Lady Who Swallowed a Fly.” Humorous and whimsical, this newer version depicts Grandma eating the entire Thanksgiving meal! Every Thanksgiving Day, we gather together and watch the morning’s Macy’s Parade, marveling at the acts and enormous puppets. Melissa Sweet tells the story of the inventor of these amazing balloons, Mr. Tony Sarg. Well-known children’s author and illustrator Nancy Tarfuri shares the story of a very busy squirrel who works hard to get ready for winter. The story is sweet but simple, and the illustrations are even sweeter. Who doesn’t love stories about the Berenstain Bears family? In this story, the Bear family enter a pumpkin contest at the annual Bear Country Thanksgiving Festival, but do they win? Read and find out! 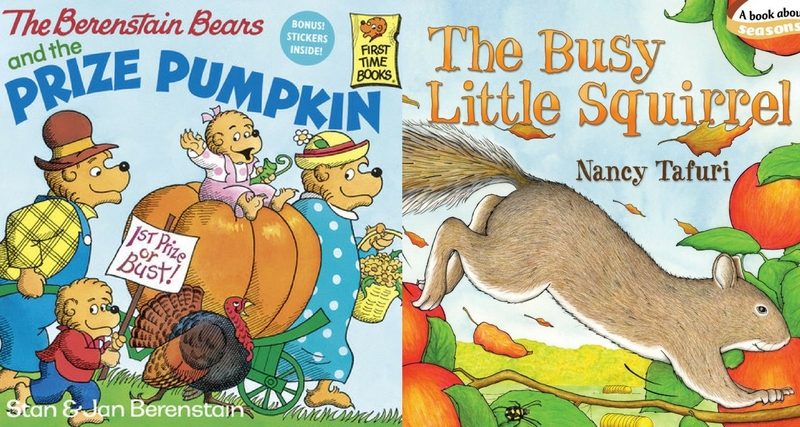 I could go on and on about my favorite fall books for children. We also have Clifford’s Thanksgiving Visit, Arthur’s Thanksgiving, and many more. If you perform a google search, you will discover many more fall books for children, along with my favorites here, from local to award-winning writers and illustrators. Some are educational, others whimsical. Whatever you choose, enjoy the beautiful season and snuggle close to your little ones.